Some people don’t want to go offshore for deep sea fishing so we offer 1/2 Day Trips for Inshore Fishing where clients can fish for smaller species of fish including Rooster Fish, Spanish Mackerel, Snapper & Yellow Tail. All types depend on the time of year & the currents. Sometimes you can find Dorado (Mahi-Mahi) inshore. 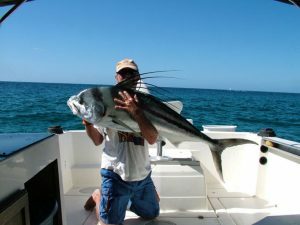 Inshore Fishing is good for clients with small children who might get bored and “fussy” on a long offshore trip. Also good for clients with wives who might not be really excited about going fishing! Inshore Fishing usually goes from 6:30 am to 11:30 am leaving plenty of time to have lunch at one of the many restaurants along the docks.